Thank you to Joni Caswell and Britvic for the fantastic Â£250 donation to Stella's School Scheme. What a wonderful company Britvic is. We had a very successful charity choir concert on Saturday and raised £1,217 for Stella's School Scheme to buy chairs and desks for 3 schools in the Niamini East district of The Gambia. 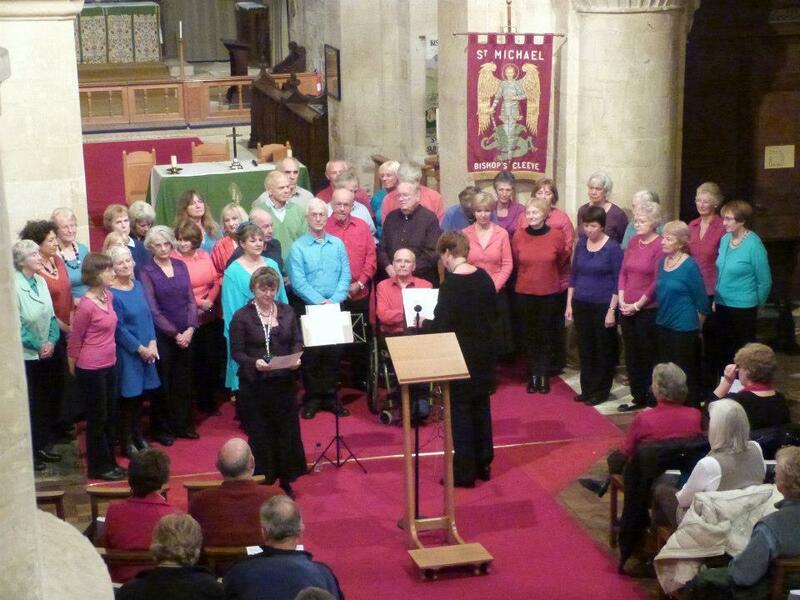 I have attached photo's of Caldicot Male Voice Choir and Winchcombe Community Choir. Both were excellent. We had over 100 people in the audience. This is what Caldicot Male Voice Choir have written about the concert for their local paper. I think it gives all the details of the evening. Conducted by Sian Hatton throughout and accompanied by Stephen Berry and John Nicholson, opening with the rousing Welsh hymn Llanfair, the choir continued to provide under the beautiful, stone arched supported roof of the 13th century church of St Michael and All Saints an eclectic mix of old and new favourites including The Lost Chord, Queen's Bohemian Rhapsody, romantic modern Welsh song, Lleucu Llwyd, written by Dewi Morris and arranged by Stephen Berry, dreamy An Evening's Pastoral and finishing the first part with the foot tapping Alexander's Ragtime Band. The interval was framed by the varied and enchanting unaccompanied performances of the Winchcombe Community singers, a mixed, forty strong choir which specialises in folk songs from all around the world. Saturday's performance included songs from Macedonia, Samoa, Nigeria, America and medieval Slovakia. Their penultimate piece, the South African National Anthem sung in Xhosa, Zulu and Tswana, particularly delighted the packed church. Caldicot MVC were delighted to join Winchcombe CC, suitably attired in sea-faring costume, to provide the chorus to the Maori Whaling Sea Shanty, John Kanakanaka. 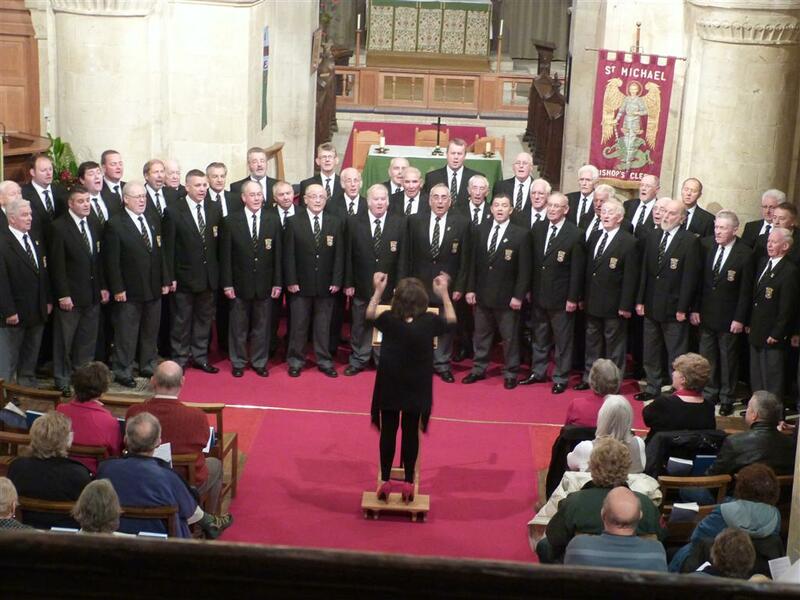 Caldicot Male Voice Choir's performance continued, to a welcoming and enthusiastic audience with a Cole Porter Medley, Sian Hatton incredibly taking the solo parts in both Can You Feel the Love Tonight and Freddy Mercury's, Somebody to Love while simultaneously conducting the choir. Continuing on with the fabulous Welsh hymn Tydi a Roddaist, the hopeful Yfory and the pretty, popular light hymn, He, the evening completed to rapturous applause with the ever popular hymn, written by Isaac Watts, Morte Criste (When I Survey the Wond'rous Cross). We were delighted that five members of Gloucester Police Choir accepted our invitation to fill our ranks for this glorious hymn. The choir is pleased and proud to have contributed to the raising of such an enormous sum from the generous people of Bishop's Cleeve and the surrounding area by providing a varied and wonderful exhibition of Welsh Choral Music. The choir is always pleased to gain new members so please come along to the Choir Hall, Mill Lane, Caldicot on Monday and Thursday evenings, or visit our web-site www.caldicotmalevoicechoir.co.uk for more information "
Satu Macdonald has run the New York Marathon! 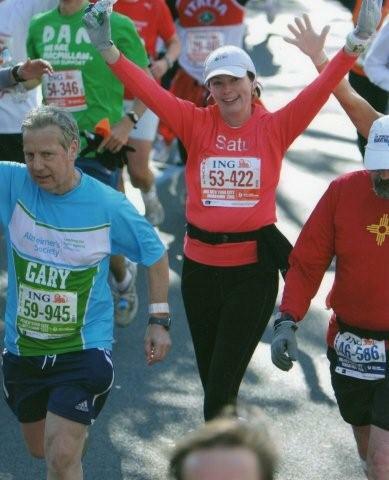 Satu did the New York marathon in 5 hours 15 minutes and Jason did it in 4 hours 25 minutes. 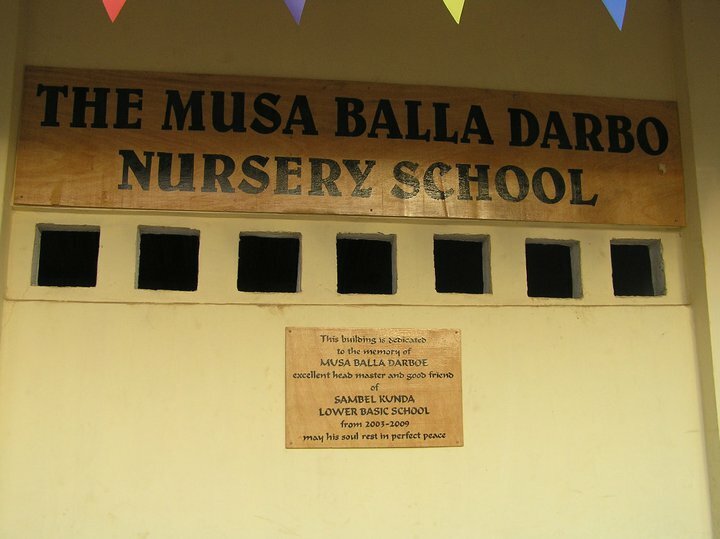 The new nursery class rooms were built in memory of Master Musa Darboe the Head Master of Sambel Kunda School and good friend to Stella. Ros Harris and Stella's School Scheme would like to thank all the volunteers who came out to Sambel Kunda and helped paint the 3 new nursery classrooms. With special thanks to Lorna Brown, Hilary Austin, Lyn Whittaker, Roger Gillespie and Linda Harley. Thank you to everyone who donated toys , bikes and slides for the nursery children and thank you to Joni Caswell for all the school class equipment. Thank you to Gotherington School for fundraising to pay for the shipment of the Gotherington playground equipment. The children really enjoy the swings. Pictures of the nursery are available in the gallery or you can click here to see a montage of some of the pictures taken during the visit. Though he may not have fully appreciated it, Gert made a huge difference for the better to the lives of a great many people that he didn't even know when he participated in the epic Calum's Road trip. 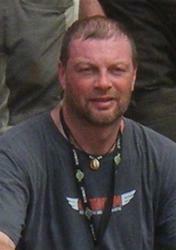 The Calum's Road bikers are considered as heroes in the areas surrounding Calum's Road. If that wasn't enough, Annette, his widow has asked that donations in his memory be made to Stella's School Scheme which sponsors children and provides educational resources in the very poor area surrounding Calum's Road, thus enabling the children to be able to take that first step out of extreme poverty when they finish their education, so even in death Gert continues to help the people of Niamina.Donations made in memory of Gert will be used to continue developing the educational facilities at Sambel Kunda as a living memorial to a very special man.Stella's School Scheme and the people of the villages who benefit from the school send their deepest sympathy and profound thanks to to Gert's family and have asked us to convey the message that they are very touched that even in this time of great sorrow for the family, they should remember the people of The Gambia. 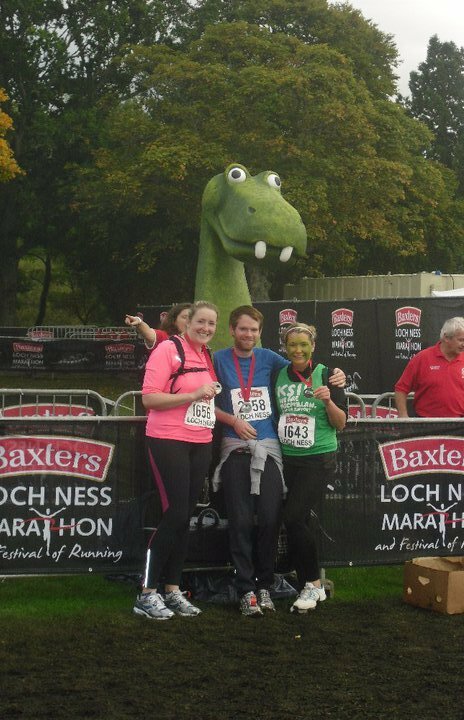 Well done to Darryl Mclennan who has completed the Loch Ness marathon and raised the fantastic amount of over £700 for Stella's School Scheme. Thank you Darryl. You are a Star !! Thank you so much for sponsoring us. Duncan managed to climb up in 1 hour 54 minutes Fantastic !! It took me 2 hours to climb down and my legs are still not working properly 2 days on !!! 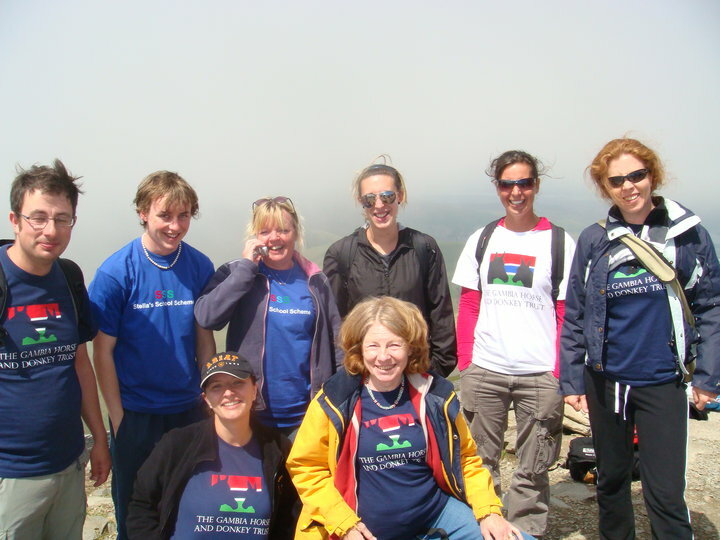 Thank you again for helping us to raise over £1000 for Stella's School Scheme and Gambia Horse and Donkey Trust. Big hugs to you Lorna for putting us all up ( or putting up with us ! ) and for the fantastic meal the night before the climb and the wonderful cooked breakfast !! 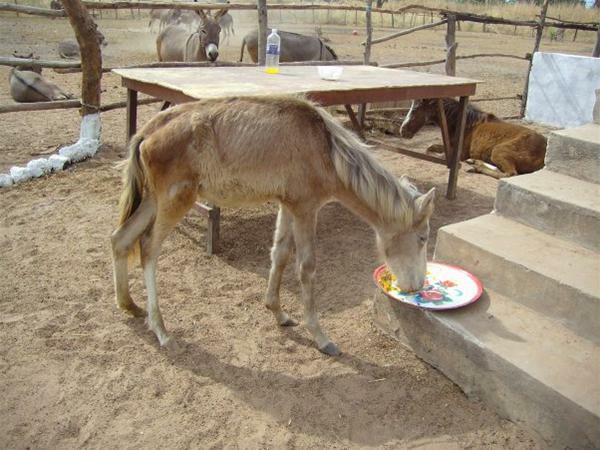 Duncan Harris ( aged 16) ,Joni Caswell and Vicki Miller are climbing Snowdon on June 12th to raise funds for Stella's School Scheme and Gambia Horse and Donkey Trust. Click on this link and have a look at the justgiving website and see the poem that Joni has written!